This entry was posted on February 6, 2019 at 2:04 pm and is filed under History, Ride reports. You can follow any responses to this entry through the RSS 2.0 feed. You can leave a response, or trackback from your own site. Thanks for posting the link to the USGS maps. By overlaying the historic maps you can find the history of both Montebello Rd and Stevens Canyon Rd (Canyon Trail). Looks like Montebello Rd connected from Stevens Canyon all the way to Page Mill as early as 1895. Most likely this was an agricultural road as the farmers and wine makers needed to get their products to market. No motor vehicles back then, just ox carts, so no need for gates. Stevens Canyon never connected through to Page Mill as a real road. If you look at the historical progression provided by the maps you see the Steven’s Canyon stub emerging out of Cupertino as it does today. Then you see a stub emerging from Page Mill heading down the canyon, not named and doesn’t go far. Probably an orchard road as their were tree orchards in that area. In 1940’s you see the emergence of the middle section of the trail. It starts as a “jeep trail” from the ranch on the ridge down what is now Indian Creek trail. After a few years the jeep trail is shown to be extended down the canyon to where Gold Mine Creek intersects the trail and a little beyond. This was most likely an agriculture route and most likely on the single ranch property. The Gold Mine Creek area of the trail today is grass land so most likely cattle grazing. The trail stopped most likely at the property boundary. 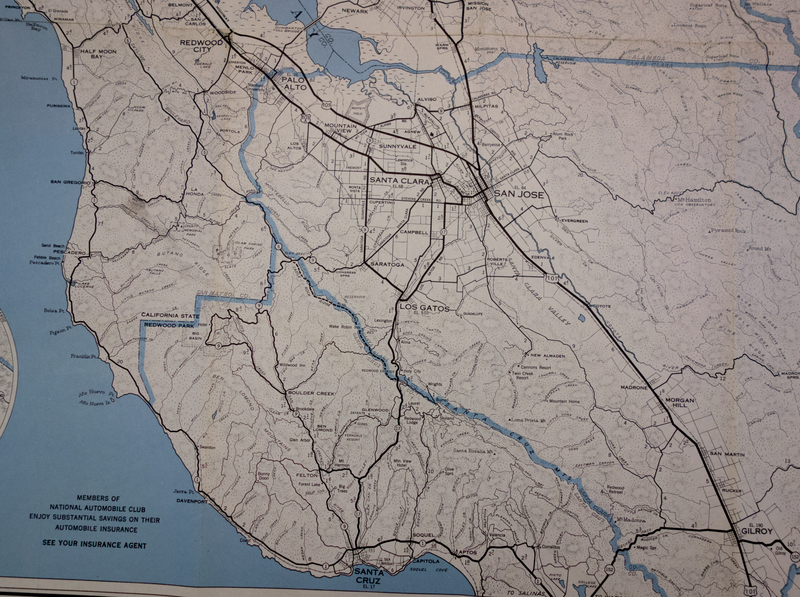 The three sections were never drawn as a complete through-way in these maps, even up to 1970. Most likely there was an informal through-way but it probably couldn’t be mapped as a road do to gated private property. In addition, the maps show the trail alignment to be different than it appears today especially near where the Grizzly Flat and Table mountain trails intersect. Looks like the trail was on the other side of the creek. Must have been a nightmare keeping any semblance of a throughway open given shifting lands when the creek rages in the winters and storms bring big trees down. So Montebello is an old, historical road, and Stevens Canyon was never a through road, only a series of linked trails that followed the creek.